PHP MySql compare table structure - ONLINE! 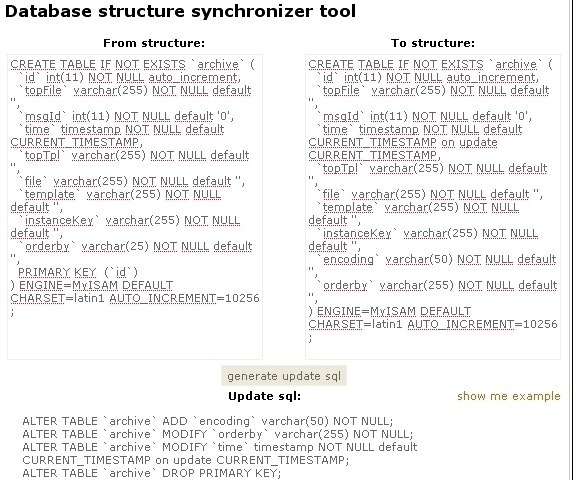 - Database structure synchronizer! PHP MySql compare table structure - ONLINE! This site can compare two MySQL database table structures and generate the necessary SQL statements to update the second table to be identical to the first. It compares the table creation SQL statements of two MySQL databases as outputted from the mysqldump command or phpmyadmin. The site determines what changed from one database to the other and generates schema alteration SQL statements to create, drop and alter tables that should be applied to one database to make it have the same schema of the other. Just paste the two create table statements that you wish to compare in the textboxes below and press COMPARE and we'll generate the necessary MYSQL update statements, copy the statements and run them in phpmyadmin or by PHP code. Se example structures at bottom of the page. you are free to use it but it come as it is without any guarantees. Always make backups of your database before you fiddle around with the tables!